The ideal spot for nature lovers. 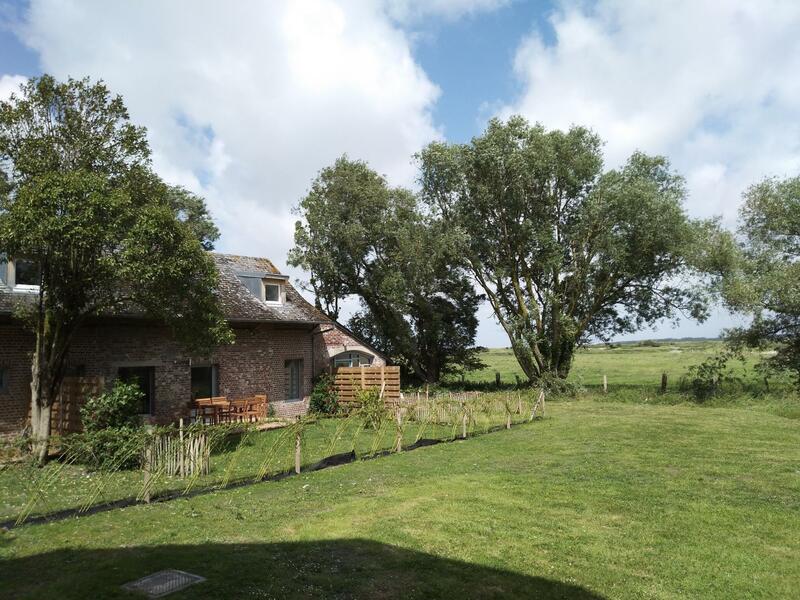 Converted outbuildings of remote mansion at heart of Baie d'Authie nature site, 4km from beach at Fort-Mahon, 600m from sea (accessible on foot). Gîte (88 sq.m.) near owners' home (separate entrance) and adjoining 2 other gîtes. Ground floor: fitted kitchen (fridge-freezer) opening onto large living room, separate WC. 1st floor (spiral staircase): 2 bedrooms (double bed) (two 80x200cm beds OR queen-size bed), attic bedroom (two 80x200cm beds OR queen-size bed), bathroom, separate WC. Central heating (no extra charge). Terrace (12 sq.m. ), little private fenced garden (90 sq.m.) with open view of the Mollières (salt marshes). Electric plancha. Gîte accessed via 2km track. Laundry room shared by 3 gîtes (washing machine, tumble drier). Tourist tax included in rent. Parking on the property. Bike hire possible.